This is a family “home from home”. This maison is owned by two families; and if you decide to come to Deux Coeurs we want you to make yourselves at home, and enjoy it as much as we do. It is equally suitable for winter or summer holidays, is well equipped and wonderfully relaxing. Samoens is one of the Alps' best kept secrets - as noted in this recent travel article. We work in partnership with local companies, especially Graham and Gaëlle and their team at Kukipegs Property Services who provide a very professional service and in-resort support, tailored to your needs. Latest images from around the Sameons village and the various activities on offer. Top of Col de Joux Plane after a gruelling ascent! This way to the Col! 1. Maison Deux-Coeurs a lovely cosy home from home, where the days adventures on the mountain were regaled over a hearty meal with plenty of wine and good company. I was thankful for the wood burning stove, the hot tub and the warmest of welcomes and care by our hosts. Conveniently situated for access to the slopes and the town centre of Samoens, you can be as independent or group orientated as you wish. The town is very picturesque and the locals and snow sports instructors friendly. 2. CPD Actif - combining the adventurous training with the other elements of active learning and personal development offers one of the fastest ways to bond a group of individuals and create an environment where everyone feels able to express both their strengths and offer their weakness for development by the group. Have just returned from a wonderful 10 days at Deux Coeurs. It was really hot, 35C, so thank goodness for the pool- it was great! Must say that despite the great heat, the house remained pleasantly cool, and for those needing respite from the heat, there were cool places indoors. Wonderful holiday for the family- children were able to cycle (quite strenuous, I believe), they went to lake and swam and did the "Go-ape", white water rafting etc. and at the house, the Xbox and technology that children enjoy,a good choice of DVDs, CDs, books and boxed games, as well as the pool and hot tub. We all enjoyed the facilities to barbecue and dine on the decking, with the gazebo to shelter from sun or wind, and to sunbathe round the pool. As a family we ate out in Samoens at delightful restaurants offering traditional French food, and when we chose to eat in, in the spacious dining area, a visit to the market was a wonderful opportunity to buy local food - the cheeses are fantastic, and the charcuterie is renowned, not to mention the irresistible patisseries from the local boulangerie. The wine was quite new to us, as it is generally unavailable in UK, but we have all developed a taste for it, it is good. The house is very well equipped, ( a Gaggia coffee maker!) and we all found the beds very comfortable. A visit to Sixt was memorable - a most beautiful little village higher up the valley, but we were disappointed that we couldn't go up the ski lift to the little restaurant at the top. The prices at Sixt were better than in Samoens, so if looking for souvenirs.......and we had a lovely lunch at a super restaurant there. The little train will take you to Sixt from Samoens on a guided tour, but we didn't avail ourselves of that. We did find prices on some things high, but there is a Carrefour in Samoens, which supplies most of our needs, and has a good choice of meat and veg and fruit, don't expect a fish counter, however! The market on a Wednesday is wonderful, but get there early, nip round quickly , as it closes at midday. Husband bought a snazzy little hat for 1 euro, and I bought a lovely pair of hand made ear-rings for 13 euros. The house is well situated for those who enjoy a leisurely stroll either into town or round the wonderful old farms in the valley. There are shady walks/cycling by the river and the house is right by the river, which is so clear, but quite turbulent, especially after the spectacular thunder storm we experienced one night, with sheet lightening which lit up the entire valley, and unbelievably heavy rain, but it just cleared away, leaving everywhere refreshed. The tap water is really good to drink,, straight off the mountain, and makes a good cup of tea. Can't recommend Deux Coeurs enough-a wonderful place which certainly ticked all the boxes for us ( all 3 generations!) and there is good support from the local team if needed. We found the guidelines for using facilities in the house clear and helpful, and for all the local amenities. Thank you for a stress free holiday. We had a lovely stay at Deux-Coeurs, home from home, well equipped, warm and comfortable. 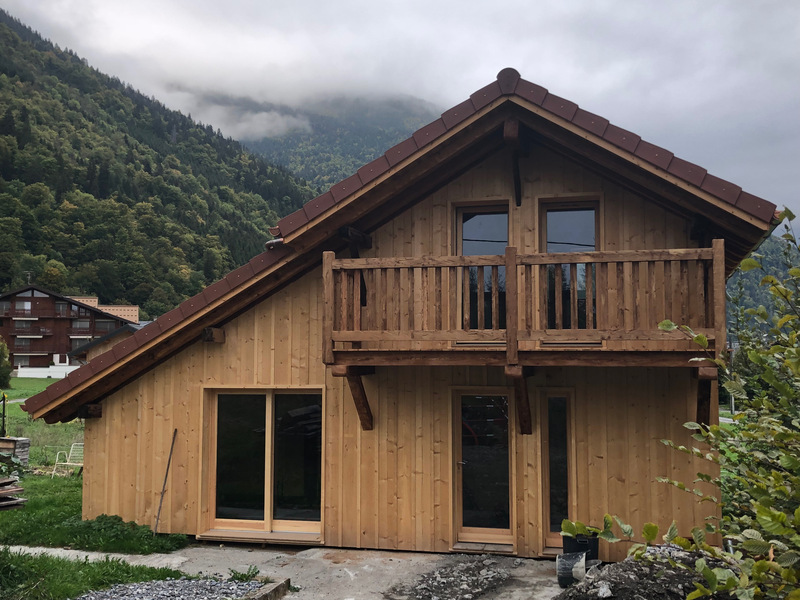 Ideally situated, a few minutes walk from Samoens centre, ski bus stops at the end of the lane a couple of hundred metres away from the house. As a family group of 10, with a wide range of ages from 3yrs upwards, the house suited us very well and allowed everyone to have their own space. 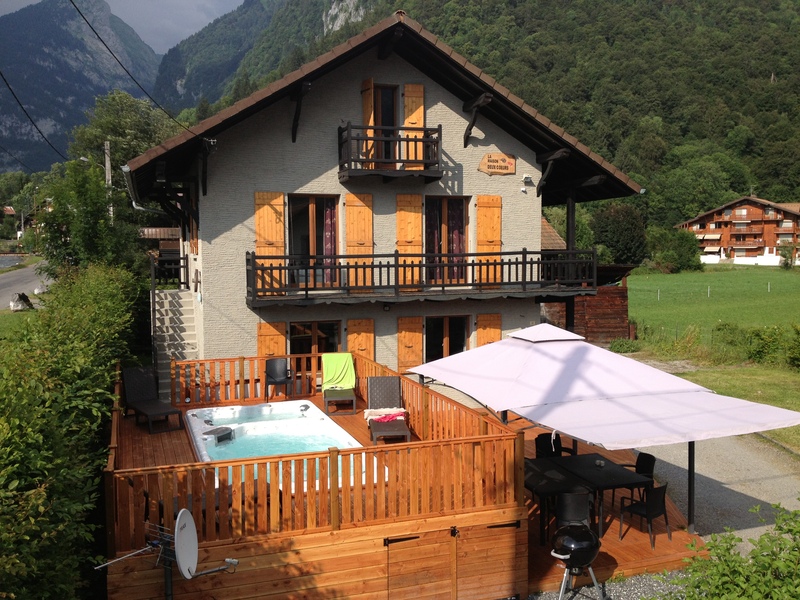 A beautiful chalet besides the running water within close reach of the slopes made for some varied skiing. The company meant that the CPD was challenging and varied which lead to a very busy 4 days and some good learning.